All images Jesús Renedo / GC32 Racing Tour www.gc32racingtour.com , click for HD & slideshow. 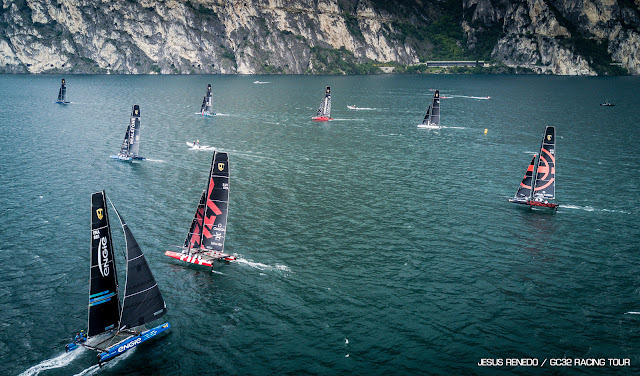 - Another sailing fest at Riva del Garda. 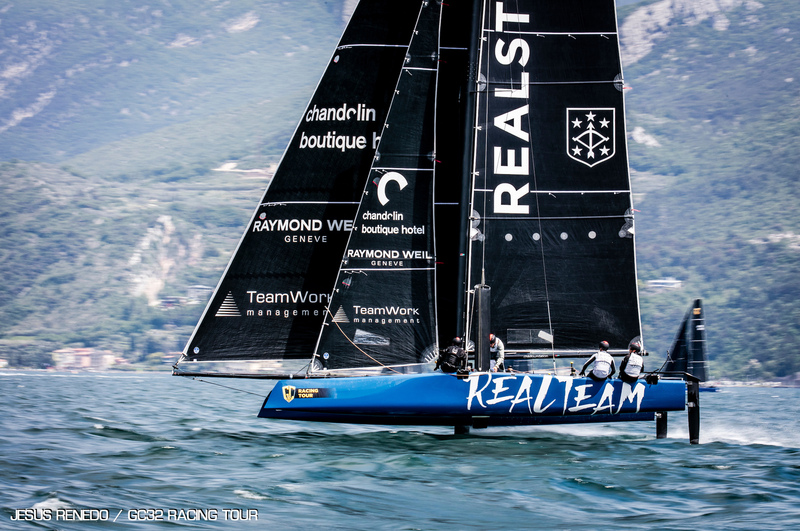 The Swiss teams dominated with Realteam taking the crown followed by Tilt and Armin Strom. For me this was a special event to follow, with an historic first Argentine crew racing in a Class I've been praising since day 1. 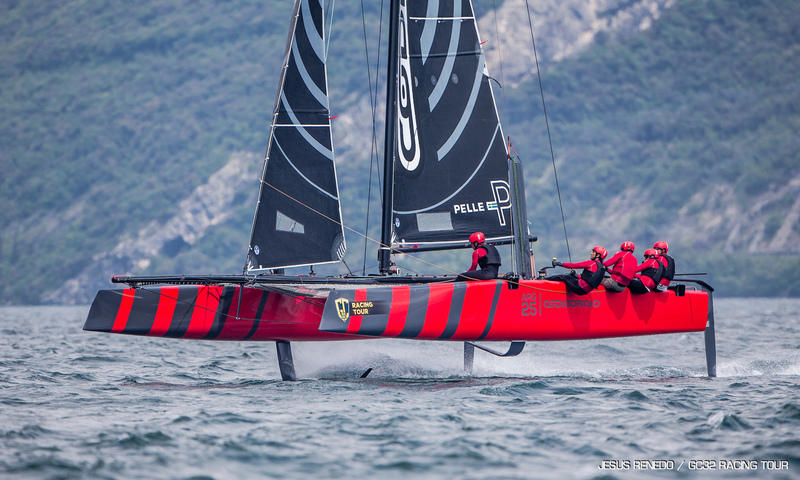 The GC32s should remain as is in terms of full manual systems, then you can upgrade foils in 5 years or whatever but they need to keep the hard work onboard unscathed. 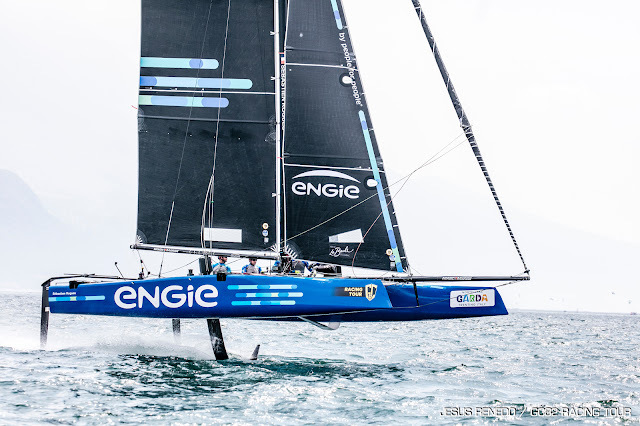 Plenty of satisfaction for our F18 friends sailing and racing a GC32, they peak in the last race where they reach a 4th / 5th position to third leg, even always starting clear from behind the fleet. Small prize in performance terms but a great push for them to continue their learning plan process towards the 2018 season. 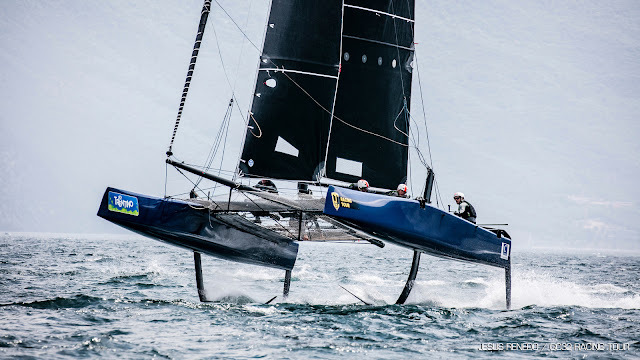 Seeing Lucas , Fede and Cuco Benitez on board, guys with whom we've been sailing F18s for years, specially with Lucas (founded the Class with us) its a great feeling. 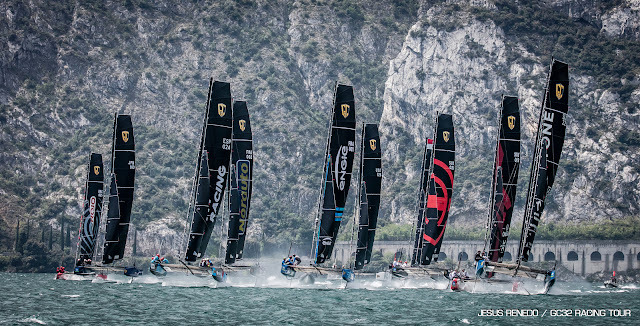 Our local multihull scene going for more each year. Cuco was a small kid when he came to race F18s from the 29er fleet. And Fede ? Well , resources are not enough to embark yourself in such project. Guts, determination and planning are key to participate in this great Class. The same emphasis he put in the F18 from the early days. 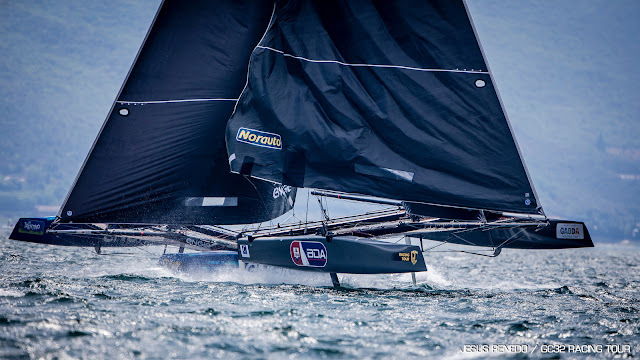 I got a call the other day, asking me how much for a GC32 , I replied: "Forget it, you got the numbers, but this boat requires something else" , definitely not for everyone even if you can afford one. Despite an impressive late charge from their compatriots on Team Tilt, the Jérôme Clerc-steered Realteam hung on to its lead to win the GC32 Riva Cup by four points after another three race day held in perfect 10-16 knot conditions on Italy’s Lake Garda. Flavio Marazzi’s ARMIN STROM Sailing Team managed third place, making the podium of this first event of the 2017 GC32 Racing Tour a 100% Swiss affair. Proceedings got underway today with a last round of the GC32 Racing Tour’s new ANONIMO Speed Challenge - an opportunity for the crews to eek out the fastest speed from their foiling catamarans and for on board guests to enjoy first-hand the thrill of going 30+ knots on a flying sailing yacht. Today, it was the turn of Jason Carroll’s Team Argo to record the high score of 27.65 knots. 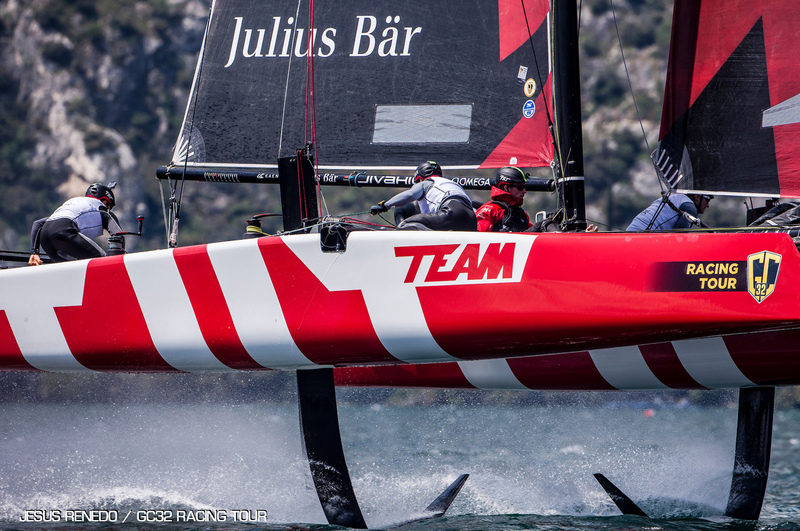 However this was not enough to better the speed of Flavio Marazzi’s team which managed 31.02 knots on Friday. 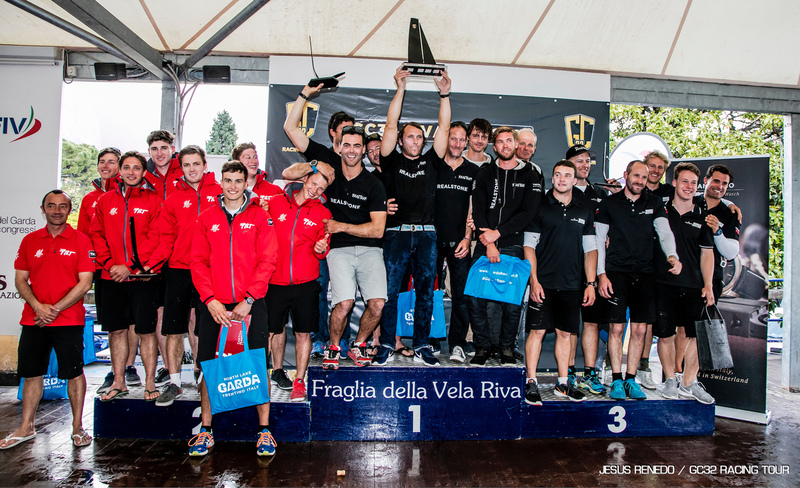 At the prizegiving at the Fraglia Vela Riva, Marazzi was presented with an ANONIMO Nautilo watch. There was a small heart failure moment when Realteam was among the backmarkers in one start. Nonetheless they managed to fight back. Under normal circumstances their 3-3-1 scoreline would have been enough to win the day, but Team Tilt was still in invincible form: In winning today’s first two races, they continued Saturday’s winning streak, scoring five consecutive bullets. 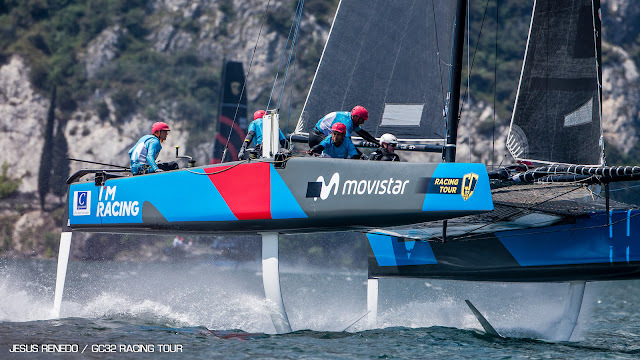 Today’s final race provided a small glimpse of what we can expect to see more of this season with other teams starting to break the Swiss dominance, including GC32 Racing Tour newcomers, Spain’s I’M Racing Movistar and Federico Ferioli’s Codigo Rojo Racing mixing it up with the frontrunners. Mamma Aiuto! led for much of the final race. The Japanese crew included two from the Japanese Red Bull Youth America’s Cup team. Of the youth teams heading for Bermuda next month Team Tilt is clear favourite, the plight of the Bermudan crew on Team BDA not helped by their capsize yesterday and, similarly, Team France Jeune by their capsize in today’s first race – all the crew were safe and their boat was quickly righted, but they were unable to complete any races today. 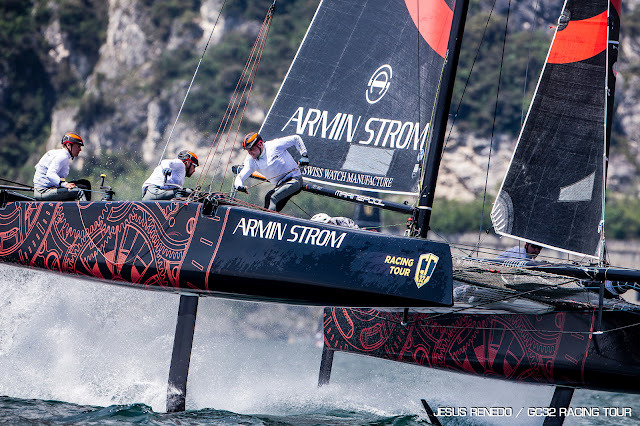 Racing resumes at the GC32 Villasimius Cup, in southern Sardinia over 28 June to 1 July .